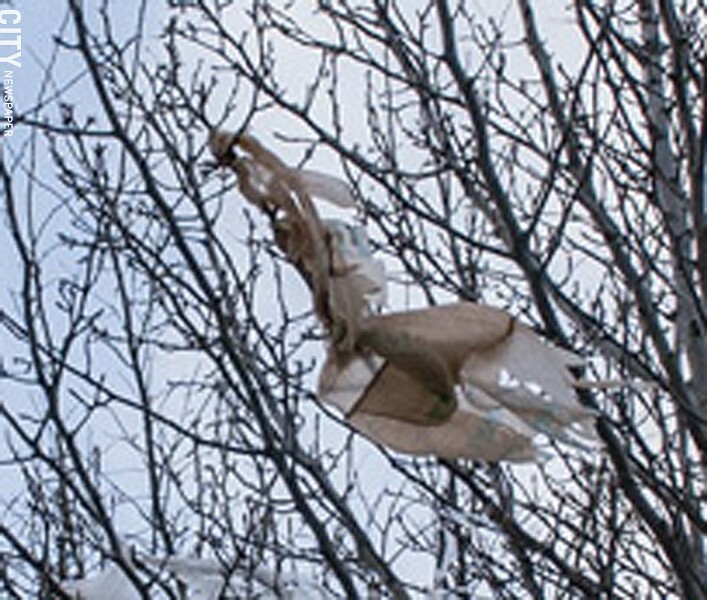 PHOTO BY RENE HEININGER A sign of the coming springtime: a plastic grocery bag flapping in a tree. Plastic bags are the things people love to hate. Many shoppers think nothing of walking out of the grocery or drug store with handfuls of the bags, sometimes with only a few items in them. And often, the option to buy reusable bags is staring them right in the face. Eventually, some of the plastic bags make their way back to the stores for recycling. But some are liberated by the wind, where they become tree-borne litter or dance in streets among the traffic. They clog storm drains and find their way into Lake Ontario, where they add to already problematic plastics pollution. Some well-meaning people toss the bags into recycling bins, but that means the Monroe County sorting facility has to shut down daily so workers can clean the sorting equipment, since the bags get entangled in it. And some people just throw the bags out; 8 percent of all landfill waste is either plastic bags or plastic product wrapping, says a fact sheet from Monroe County. State environmental groups say a ban on single-use plastic bags would help address, if not eliminate, all of these problems. And they're pushing state lawmakers to take action this year, preferably in the state budget, which has an April 1 deadline. Democratic State Senator Liz Krueger has already introduced a bill to ban single-use plastic bags from stores, and Democratic Assembly member Kevin Cahill sponsors an Assembly bill that would place a fee on all single-use bags. "We're pleased that there's discussion at the state level about implementing a policy that will transition New Yorkers to switch to the environmentally friendly and cost-effective solution, which is reusable bags," says Brian Smith, associate executive director of Citizens Campaign for the Environment. And with the ban, environmentalists want the state to set a fee on paper bags and other single-use bags, which would give people incentive to switch to reusable instead of just relying on paper bags from the store. Advocates say the approach has worked in other places, including California, which has a statewide ban on single-use plastic bags. Peter Iwanowicz, executive director of Environmental Advocates of New York, says the fee revenue should go toward state environmental funds or programs, similar to the way unclaimed bottle deposits are handled. "I think if you're going to assess a fee dedicated to environmental programs, that's a budget issue," Iwanowicz says. "So that's where it should be." If bag ban and fee legislation don't pass as part of the budget, they could still advance in April, May, or June, depending on whether legislators are willing to act. Plastic bag industry groups, particularly the American Progressive Bag Alliance, have fought against bans in states across the country. And other organizations aren't keen on bag bans or fees, either. "Wegmans doesn't believe banning or taxing certain bags is a sustainable solution to the problem," says Jason Wadsworth, the company's sustainability coordinator. The company has been able to reduce single-use bag consumption by educating customers about reusable bags, Wadsworth says. And it reminds them to bring plastic bags back to the store for recycling; Wegmans plastic bags are made from 40 percent recycled plastic, all of which was returned to stores by customers, he says. The company's recycling rate for plastic bags was close to 50 percent last year, he says. He also argues that banning plastic bags will lead to increased consumption of paper bags, which have a greater impact on the environment. Environmental groups counter that paper bags can be recycled at the curb, unlike plastic bags. And again, they point to the need for a ban on plastic bags to be accompanied by a fee on paper bags to discourage what Wadsworth describes. "The goal is to end our use of single-use bags, not transition from one to another," Smith says.